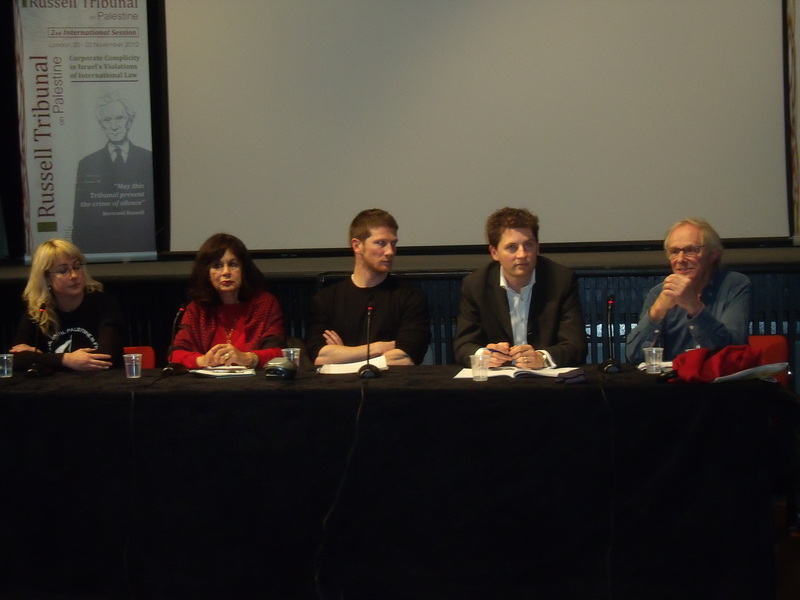 Last night at Amnesty International in London, against a backdrop of a quote by Bertrand Russell (“May this tribunal prevent the crime of silence”), sat four anti-Israel activists and Paul Troop, a solicitor, presenting the raison d’etre of the Russell Tribunal on Palestine. The first Russell Tribunal was convened in 1967 in Sweden and Denmark to harness public opinion against the Vietnam War, but it was largely ignored as being merely a show trial. And so to the second Russell Tribunal, this time on Palestine. It is due to convene over three days at the Law Society in London on the 20,21 and 22 November. Over that weekend some 20 or so companies are due to be put on trial for complicity with “Israeli war crimes”. Israel is not on trial, the companies are. It will already be presumed that Israel is in breach of international law and has committed crimes against humanity. When I asked Paul Troop where such breaches of international law are judicially laid down the best he could do was direct me to the “opinion” of the International Court of Justice on the wall dividing Israel from the Palestinians. None of the companies on trial will be represented. Letters have been sent but none have yet responded to say they will be present. Dr. Ghada Karmi spoke of the Palestinian issue being the moral issue of our time. This polemic is freely bandied around by anti-Israel activists and makes people whince since we know that 3,000 children die every day in Africa from AIDS, malnutrition, malaria and other diseases when they shouldn’t be in this age. Dr. Karmi cited Cast Lead and the siege of Gaza and was outraged that Israel had not even apologised over something as clearcut as the deaths on the Mavi Marmara. She said that Israel was now too woven into the fabric of the international system and because of this was never being called to account. There is no major organisation or state that backs the Palestinians. She felt that the Palestinian case is based on hard international law and looked to the RTOP to, hopefully, get the campuses active and harness the intellectuals. There is “corporate complicity” with Israel but imagine, she said, if all these companies withdrew their investments from Israel. Ewa Jasiewicz spoke next. According to the Community Security Trust Jasiewicz recently helped desecrate the walls of the Warsaw ghetto, which is now a cemetery to the 100,000 Jews who died there during the Holocaust from disease, starvation and random executions by the Nazis. Activists daubed “Free Gaza and Palestine” on a ghetto wall (below). Jasiewicz hoped that the RTOP will “denormalise Israel’s false legitimacy” and said that “Israel is trying to delegitimise the delegitimiers. We are the delegitimiers”. She was part of the recent flotilla to Gaza but admitted that the flotilla was not about humanitarian aid for the Palestinians but about breaking the siege of Gaza. She told us that the occupation is everywhere, not just in Palestine, but is reproduced internationally on a daily basis and she urged activists to continue shutting down places like Ahava and Carmel Agrexco and then turning to international law to support them. The occupation exists, she said, not because of Jews but because of capitalism. These companies are not committed to Israel but to making money. She hoped that people will use the tools from the RTOP and apply them in their work places, homes and down the pub and that governments will eventually apply sanctions, as they did to apartheid South Africa. Film director Ken Loach spoke of this being an incredible story about the breach of international law. “We just want the rule of law. No community can live without law but that is what we are permitting,” he said. He called for independent politicians and criticised Tony Blair and Gordon Brown for being patrons of the Jewish National Fund which, Loach said, is about collecting money for land being bought on the basis of racial purity. He spoke of “one image” he had of the settlers being on high ground and the Palestinians being downhill and who cannot use their land or vineyards because settler effluent flows downhill and destroys that land. “It is just a simple detail, the devil is in the detail, but how revealing,” he said. He referred to maps since 1947 which shows, he said, how the Palestinians have been continuously pushed out. This was evidence of lack of good faith that the Palestinians will ever be allowed to live side by side with Israel. He challenged the idea of a state based on race: “We have had enough experience to prove that race as a founding principle is intolerable”. (A non-political analysis of Ben Gurion’s speech can be viewed here). In the Q&A I asked Loach why he singled out Israel for criticism for its racial and religious make-up when most other countries around the world are the same. He repeated his comment about past experience of states basing themselves on race but he agreed that other countries are based on religion and to show his objection he had boycotted the Iranian film festival. Someone asked whether Loach would make a film about the suffering of the Palestinians but he replied that that would have to be done by an Arab. When asked what would Britain do if it was under attack from rockets Loach simply replied that it was not right to balance the violence of the oppressor with the violence of the oppressed. The RTOP is an expensive charade (the jury is being flown in from all over the world), yet again not benefitting the Palestinians in the slightest. More shameful was the presence of Ewa Jasiewicz and then acclaimed film director Ken Loach justifying Palestinian violence and unabashedly renewing old anti-Jewish tropes about Jews poisoning their neighbours and killing children. Last night at Amnesty felt less about the delegitimisation of Israel and more about the delegitimisation of living Jews and the desecration of the memory of dead ones.